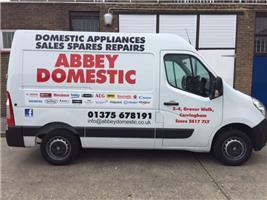 Abbey Domestic - Appliance Services/Repair based in Corringham, Essex. We are a Domestic Appliance Sales, Spares and Repair Centre, trading for over 35 years, based in Corringham, Essex. We have ex Hotpoint/Whirlpool trained engineers covering Corringham, Stanford-le-hope, Basildon, Grays, Chadwell-st-Mary, Tilbury, Averly, South Ockendon, Brentwood, Canvey, Benfleet, Wickord, Pitsea and Thurrock. We Specialise in the sales, spares and repair to washing machines, washer dryers, tumble dryers, dishwashers, electric cookers, vacuum cleaners, integrated ovens, electric hobs, integrated dishwashers and washing machines. ALL REPAIRS COME COMPLETE WITH A 12 MONTH FULLY WRITTEN GUARANTEE. We have a double retail outlet and workshop based in Corringham town centre with over 100 new appliances and a selection of reconditioned appliances on display at any one time and should you wish to pop in for some advice or for that extra peace of mind. We also offer a free estimate for any appliance that is brought into us in store. We are open 6 days a week from 8.30 - 5.30pm Monday to Friday and 8.30 - 4pm Saturday. We offer a full installation service on any product whether its purchased from ourselves or another store and offer free delivery on any new appliance bought from ourselves. We are fully accredited members of Retra and are authorised to undertake repairs on behalf of RetraCare. Please don't hesitate to call us on 01375 678191 should you require a repair, advice or a new machine and we will do our upmost to help you.